Penn quarterback Ryan Glover, shown here against Lehigh last month, has managed the Quakers offense well. No quarterback likes the term "game manager." Still, for the overall success of a team, doing an efficient job of managing a game is the most important thing a signal caller can do. 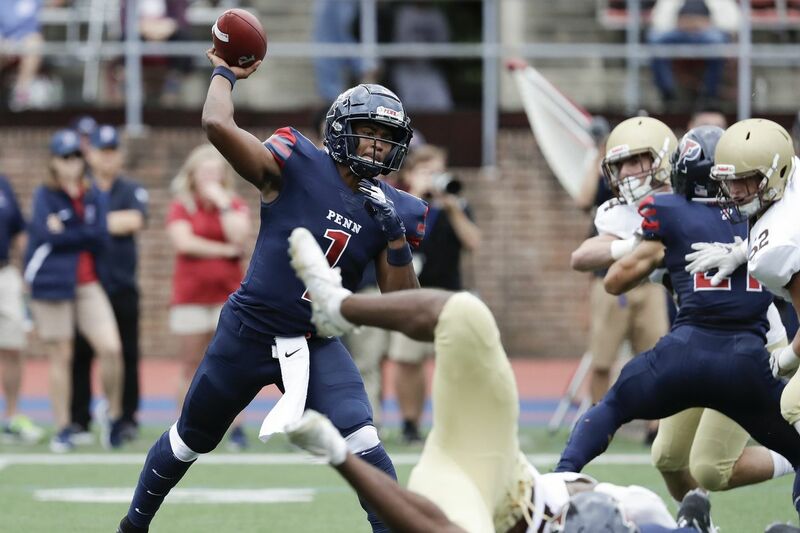 With his Penn playing experience almost exclusively confined to this season's first four games, the best thing sophomore quarterback Ryan Glover has done is be efficient. The game is slowing down for Glover with each start, and he gains confidence analyzing what's happening on the field and how to handle things. That's a natural part of the learning curve. The Quakers are 3-1 going into Saturday's game against Columbia, because Glover has avoided making many of the mistakes that typically accompany the development process. "I think the process has been pretty smooth," said Glover, who won the starting job despite throwing just two passes as a freshman. "The big thing is that I obviously have a lot of great weapons around to help me. It's not like I have to do things by myself. "I definitely think I'm progressing mentally in my decision making. I'm becoming more comfortable with the playbook. Once you get comfortable with the playbook, you don't worry so much about the plays and the actual concepts of them. That frees you to focus more on what the defense is trying to do." Glover has completed 57 of 98 passes for 610 yards and four touchdowns. He has run 41 times for 156 yards and a touchdown. He has not been spectacular, but he has been reliable, and he hasn't made a ton of the mistakes that can put his team in bad situations. Glover (1) does not focus on statistics. He said he just wants to win. In the Quakers' 31-27 win over Sacred Heart last week, Glover drove the Quakers 87 yards in the final 3½ minutes of the fourth quarter and connected with receiver Christian Pearson for a game-winning 10-yard touchdown pass. "He is maturing every single day," Penn coach Ray Priore said of Glover. "Only time and experience is actually going to get you there. What's remarkable about Ryan right now is how poised he is out there. He doesn't get rattled." Glover, who is enrolled in the Wharton School, went to Penn as the two-time Georgia 5A player of the year at Woodward Academy in Atlanta. Penn offensive coordinator John Reagan "emphasizes smart decisions and getting the ball to guys that are open," Glover said. "Honestly, going forward, the only thing I want to do is win every game. I'm not looking at any statistical goals. "If we can be better each week as an offense than we were the week before, we'll be doing a good job of meeting our goal." The Quakers rebounded from a bad loss at Dartmouth to beat Sacred Heart, 31-27. The Quakers finished 3-0 in out-of-conference games for the first time since 2003. Wide receiver Christian Peterson, who had been nursing a hamstring injury, had seven catches for 104 yards against Sacred Heart. Senior linebacker Nick Miller has had at least 10 tackles in all four games this season and in 12 of his last 14 games. Junior Taheeb Sonekan tied an FCS record by blocking two field goals against Sacred Heart. Columbia controlled the ball for an incredible 42 minutes, 30 seconds in a 34-24 win over Marist. The Lions limited the Red Foxes to 38 plays. In his second career start, sophomore quarterback Josh Bean threw for a career-high 262 yards and two touchdowns. Penn's Karekin Brooks is second in the Ivy League with 461 rushing yards but leads with seven rushing touchdowns. Brooks has scored a touchdown in five straight games dating to last season. The Quakers already have 21 sacks, passing last season's total of 18.